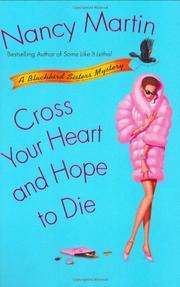 After three paperback adventures in couture and crime, Philadelphia’s Blackbird sisters debut in hardcover. Bereft of the inheritance their debutante past prepared them for, the Blackbirds have coped differently. Twice-widowed Libby, a distributor for Potions and Lotions, is lining up naughty parties for her friends and relatives. Emma has bounced out of rehab to play Lady Godiva for the debut of ex-comedian Brinker Holt’s revolutionary Brinker Bra. Nora, who’d seem like the downright sensible sister (“If you don’t know where you’ll end up at the end of the day, always choose Armani”—how’s that for news you can use?) if it weren’t for her romance with Mafia prince Michael Abruzzi, carries water for Philadelphia Intelligencer society columnist Kitty Keough until Kitty’s corpse is dumped on her front porch. The atmosphere is as thick with suspects as innuendo. There’s Hemmings Pierce, grasping uncle to preteen textiles heir Orlando Lamb; ambitious ad exec Sabria Chatterjee, who’s just landed the Lamb account; Monte Bogartz, the washed-up country-and-western signer Emma’s dragged home; and the nubile Finehart twins, aspiring spokesgirls for the Brinker Bra. But the cops don’t need any of them, because Danny Pescara, the triggerman who’s confessed to the crime, claims Michael hired him. Not a single overweight, ill-dressed, or remotely ordinary character disturbs the high gloss. The mystery, by the way, is settled before the big question: How will Nora’s New Year’s Eve party go?